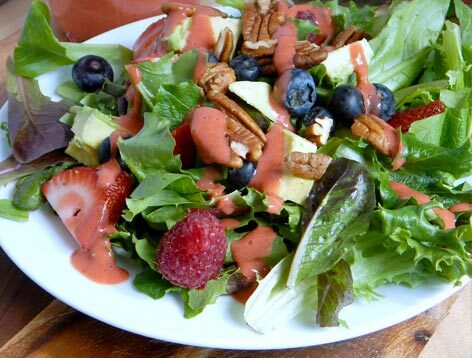 Prepare salad greens, cheese, pecans and strawberries by arranging on plates. To make vinaigrette: thoroughly whisk vinegar and salt/pepper in a small bowl. Add the EVOO in a slow stream while continuing to whisk until it is emulsified. Adjust vinegar and oil ratio to your taste. Pour over the prepared salad, top with sprouts and serve immediately.